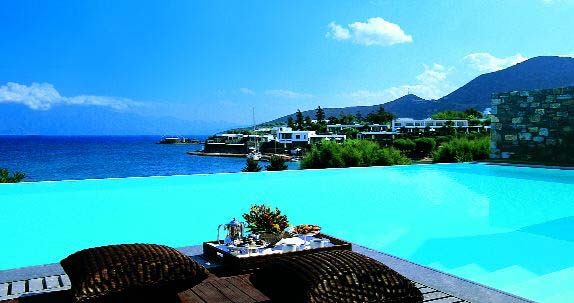 Rising over the azure waters of Mirabello Bay on the northeastern coast of the Mediterranean island of Crete, this exclusive luxury resort is set in 20 acres of lush green gardens and sparkling coastline. Located just one kilometer from the former fishing village of Elounda, nine kilometers from the capital town of Aghios Nikolaos, a 50-minutes drive both from Heraklion International airport and port, the Elounda Bay Palace is an oasis of recreation and luxury for holiday makers and business travellers alike. Built in traditional Cretan architecture, the hotel boasts 244 spacious guestrooms, suites and bungalows, all designed and decorated in modern style with subtle touches of luxury, including air-conditioning, marble bathroom, Satellite TV, music programmes, direct-dial phone, safe deposit box, mini bar, bath robes, slippers, hair dryer and private balconies or terrace opening to splendid garden or sea vistas. 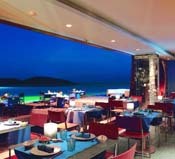 Guests can choose from a variety of restaurants, where they can experience a wide and imaginative selection of international and local delicacies, accompanied by live piano music Thalassa Restaurant. A large range of international and local drinks and cocktails is served at the three bars, while the piano bar at the Lounge stays open until the early hours for the night owls. The hotel’s swimming pools meet all Health and Safety regulation standards. Other services include chauffered airport transfers, limo, helicopter or Learjet service, car and yacht hire, parking, 24-hour room service, fitness room, Thalaspa Chenot located at Elounda Beach Hotel, shopping arcade, beauty treatments, babysitting and secretarial services. A paradise for sport fans, the hotel has a water sports centre, SCUBA diving, sailing, water skiing, windsurfing, five flood-lit tennis courts, basket and volley ball court, bridge lounge, table tennis and billiard. The 18-hole Crete Golf Club is a 35-min drive from the hotel. For night entertainment there are theme nights. The hotel’s conference centre featuring offers specially designed meeting areas equipped with state-of-the-art audio-visual equipment to accommodate all types of events, from intimate gatherings to large meetings. The Elounda Executive Conference Centre has been a popular choice among major international meeting planners and conference organisers working for some of the most successful companies.